Chosen by Kait of Kait’s Plate, this week’s TWD was soft, warm, chewy and downright perfect. Especially since we’re experiencing the “winter-that-will-never-end”. Seriously, this is Texas… bring on the heat!! 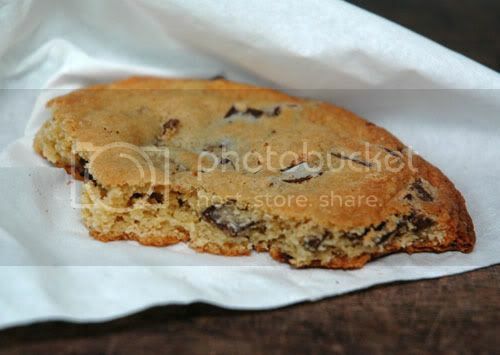 Thats a gorgeous photo of a cookie, which is why you should stop by my blog for your award! The fact that you only got the photo of the last cookie shows how well-loved they were! Mine disappeared pretty quickly too. I’m glad you enjoyed these! They weren’t a favorite here – too thin and crispy – but always fun to try a new recipe. That photo really says it all! I thought these were excellent CCCs. I’m so glad these were such a hit! At least you didn’t have to wrestle a co-worker to get their cookie back for the photo! Looks like your cookies turned out wonderful. They look good and it sounds like you really enjoyed the recipe! We love different flavors of lemonade and this one sounds very good. Thanks.